Secretary to the Law Reform Commission Lucas Omara Abong (right) and other commission members appear before MPs on Thursday. Photo by Vincent Kasozi. KAMPALA–The Law Reform Commission has advised Parliament that the new KCCA law must do away with elections in Kampala in order to end power conflicts. 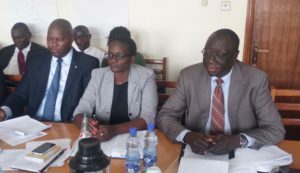 The secretary to the commission, Lucas Omara Abong, told the Presidential Affairs committee of Parliament this morning that Kampala cannot operate with two conflicting systems of government. He was giving the commission’s recommendations on the KCCA amendment Bill 2015 which the committee is currently scrutinizing. “If the central government is going to manage Kampala, the central government can manage through agencies and ministries……..so the idea that you are going to have part of the central government which has got elected people is a likely problem,” he advised. He notes that the bill seeks to operationalize Article 5(4) of the Constitution which gives government executive control over Kampala as a capital city but points out that the election of leaders to manage the authority creates a government within a government which gives birth to conflicts. The bill seeks, to among others, provide for the lord Mayor to be elected by the council from the councillors, to clarify the roles of the Lord Mayor and the deputy Lord Mayor and to rationalize the provisions relating to the metropolitan physical planning authority with the provisions relating to KCCA. Omara Abong suggests that government either adopts an absolute centralized system and govern the city through an agency or allows for complete decentralization as is done in other parts of the country, he argues that the two cannot co-exist. He, however, points out that ruling out elections will create a feeling of disenfranchisement among the city residents and thus there must be a deeper consultative process to arrive at a solution. “So our proposal is that this is not a matter that we can sort in a board room, this is a matter we need to hold a deeper conversation on, consult and research about,” he stated. The power struggles between the elected leadership led by the Lord Mayor Erias Lukwago on the one hand and the technical wing led by the Executive Director Jennifer Musisi have been a major characteristic of the operations at City Hall ever since the current law was enacted in 2010. Both leaders have moved to stamp their authority on the city leading to bitter infighting and public spats that have dented the image of city hall. The chairperson of the committee, Jessica Ababiku, asked Omara to provide guidance on how the MPs can streamline the roles of the two offices should they opt to retain election of leaders in Kampala. The Kassanda south MP Simeo Nsubuga questioned Omara on whether the commission has ever compiled a report on the KCCA act 2010 seeing as it has failed to work. “According to me ever since this law was enacted by Parliament we can say it has not worked. As law reform commission has you ever made a report,” he quizzed. Ababiku asked the commission to compile a report for the committee on what each of the two alternative forms of government at KCCA would entail in terms of structures and leadership in order to make the proposed law a success. “It will not be you to decide, in the end we will decide but we need that rich knowledge to be presented to us.” She assured the commission members. Omara also advised on the creation of the Metropolitan Physical Planning Authority under the KCCA act. He advised that it was not plausible to have a planning authority whose jurisdiction would most likely extend beyond the boundaries of its parent authority KCCA. “This is problematic because the Metropolitan Physical Planning Authority is envisaged to exercise beyong Kampala district to include Mpigi, Mengo, Wakiso and Mukono.” He told the committee. Omara notes that the creation of a metropolitan physical planning authority should be done under a separate law that cover more than Kampala.